Let me ask: What are some of the biggest problems you're having with your website? The design gets outdated so quickly, and we don't have the resources to update it every 1-2 years. I have trouble demonstrating ROI from my website and tracking meaningful analytics. I want to make improvements, but don't have the skills. My website isn't really benefiting my marketing/lead generation strategy. We call it an "inbound website," and it’s a great partner to an inbound marketing strategy. You know the type, with basic information and a "contact us" page? Your website must now be an online sales platform for your business — an integral part of marketing to prospects. If your website isn't selling around the clock, you're missing out on leads and revenue. The inbound website is a new way to think about your online presence. Your inbound strategy and marketing funnel are baked right into your website. You have a dedicated web team (in-house or hired) that monitors performance and makes changes monthly. You typically host on a platform that makes growth-driven design easy. An inbound website is still a relatively new idea for many marketers, so I'd like to break down how the model works. Here’s are the advantages of an inbound website redesign: How it can grow leads and conversions, trade cost for value, and improve ROI for your business. Download the free eBook, "Grow Leads and Revenue With an Inbound Website Redesign." 1) You’ll drive conversions by creating a 24/7 marketing funnel. Oftentimes marketers think about a website as a piece of a marketing strategy. But starting right now, don't think about your marketing strategy and your website as two different things. They're entwined. Your website is the hub for your marketing and sales strategy — a complete lead generation platform, with marketing strategy baked right in. Think about how your marketing funnel works with the inbound equation. You have different elements and assets to attract, convert, close, and delight customers. When you attract attention online, where do you drive traffic? Your website. Where do you primarily host your blog and content offers? Your website. Where are people converting on your offers? Your website. How do you host forms to gather more information about people, so you can effectively market to them? Well, you know by now. Your inbound marketing strategy should be the driving force for your website — and should dictate your website’s organization and user pathways. More simply, you'll set up your website to align with the inbound methodology. A blog and search-engine-optimized pages to attract site visitors at the top of your funnel. Corresponding conversion elements, like landing pages and calls-to-action, to help convert visitors into leads. Forms and other tools to gather lead intel, so you can better nurture leads and eventually close them into customers. When you start on your inbound website redesign, you don’t just think about aesthetics — you consider functionality, too. Ideally, you’ll redesign your site’s entire structure in accordance with the inbound methodology. That is, each page serves a specific purpose, and corresponds to a specific point in the buyer’s journey. A visit to your website isn’t random. It’s the first step on a pathway towards conversion. Each click should be logical and clearly defined — One page leads to the next, as you move users further down the journey. A website that eventually works as a 24/7 marketing funnel, driving conversions while you sleep. 2) You’ll generate leads by showing up earlier in the buying cycle. Did you know that buyers complete more than half of the buyer's journey before talking to sales? This means that your buyers are already researching and deciding on solutions long before a sales call. The most successful companies are present in the first half of this journey — their websites help educate buyers throughout the sales cycle. Is your website up to the task? With a traditional website, you may publish basic information about your services. Then, you wait for website visitors to visit "Contact Us" and place a call. With an inbound website, you nurture leads gradually, from first touch to final purchase. Your website is paved with content for the buyer's journey... AKA, those three stages that buyers take before purchasing a product. Awareness — Person is aware they have a problem, and they're looking to identify and understand it. Consideration — Person becomes aware of potential solutions (including your product or service!) They actively seek to understand these solutions better. Decision — Person is fully bought in to the solution, and is now deciding where, when, and how to purchase. Do you see how your website content has a chance to address all three stages? By hosting content throughout the buyer's journey on your website, you write the narrative of first how and then why your solution is best for person's problem. That makes you present for that “zero moment of truth,” the critical moment when people are researching and deciding on where (and how) to purchase. Without such a content strategy, your business will have a hard time generating leads online and driving sales. 3) You’ll see steady improvement in performance and design. Are you redesigning your website every few years to keep with current trends? What happens in between redesigns? Chances are, if your website isn't improving all the time, it's missing out on leads and sales. That's the genius of a growth-driven design — a fundamental part of the inbound website model. You wouldn't ignore your marketing for a year, let alone a month... so you shouldn't let your website gather dust, either. Instead of yearly redesigns, you invest in monthly changes to your website design and strategy. Your web team (or an agency with an inbound website service) will set or revise SMART goals to pinpoint certain metrics of value to your business. They will analyze data on your website performance. They'll monitor things like content conversion, button clicks, popups, design organization, landing pages, and the purchase path as a whole. They can use tools like Hotjar, implement user testing, and watch performance in Google Analytics or your CMS. Then, they'll make frequent improvements reacting to the data — ideally, on a monthly basis. Then, repeat with step 1! You’re not waiting for the next redesign to roll around to make improvements and fix problem areas… you’re proactively committing to your website’s success. The result? Your website is constantly showing its best face to buyers. It's converting at a higher rate and growing. You can head back to the C-suite to brag about your great ROI! 4) You trade one-time cost for long-term value (and prove ROI). 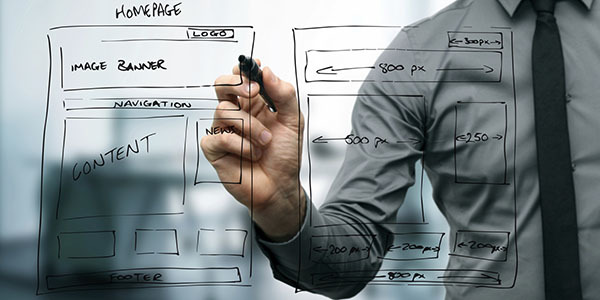 When you think about a website redesign, you might be planning the appearance of your website. But what about the functionality? What about lead generation potential, and conversion opportunities? Many businesses use periodic website redesigns to keep their websites up-to-date — and they focus mainly on aesthetics. You go into a redesign without much strategy, so you inject money without promise of ROI. Redesigns can (and often do) go over budget and take longer than planned. In between redesigns, your website isn’t growing and improving — meaning your investment only generates return as long as that strategy is relevant. With an inbound website, you don’t need to cram all of your strategy for the year into one redesign — you’re constantly improving. You can generate more value by investing month-to-month in incremental changes, instead of one big website redesign cost up-front. There’s also immense value in being able to prove ROI: According to the 2016 State of Inbound report, organizations that can calculate ROI are 1.6X as likely to receive higher budgets. With an inbound website model, you’ll always be monitoring data, so you’re aware of how your site’s performing — and proving that your changes are having an impact. 5) You’ll qualify contacts with smart content and baked-in lifecycle strategy. According to the Annuitas Group, nurtured leads make 47% larger purchases than non-nurtured leads. It's simple: Better educated leads have more trust in your solutions, and make more confident investments. What does your lead nurturing process look like now? For many marketers, it’s either manual and cumbersome, or nonexistent. Are you manually moving people in and out of different lists, emails, and processes — trying to figure out where the heck they are in the buying process so you can tailor to them? Or, are you not nurturing leads at all, and applying a wide umbrella experience to everyone? Either situation is a mess… and leaves business leads on the table. When an inbound website is set up correctly, though, it creates a complete lead nurturing process automatically. This makes qualifying leads a snap. With clear pathways for the buyer’s journey baked into your website, you’ll have an idea of where people fall in your sales cycle based on which pages they visit, which offers they’ve downloaded, and which forms they’ve filled out. You’re not piecing together different actions to try and understand intent — you’ve set up a complete customer lifecycle with your website content. Maybe you've downloaded a website template and are wondering how it's going to generate leads and produce ROI. Maybe you're dabbling in inbound strategy elements — like blog posts, landing pages, and calls-to-action — but aren't seeing them come together. An inbound website will give direction to your strategy and web design. Real success comes in combining both elements: a solid inbound marketing strategy and an inbound website to execute it. We see many people start with strategy planning and then try to redesign their website — but they really must happen in tandem. Download the free “Inbound Websites” eBook if you’d like to learn more about the process and how it grows revenue. Decide if your web team could handle an integration with your marketing efforts — or if you need to partner with an inbound website agency. Analyze your current web hosting platform and CRM to see if they can easily sustain the inbound website model. A note on platform: Your website's hosting platform can make a huge difference to your inbound website. If your website's design relies on hard code, you'll need someone with marketing background and coding chops (not to mention a lot of free time) to monitor the site and make improvements. Free platforms like Wordpress, on the other hand, can be a great easy-to-use hosting option. But these often don’t relate as closely to your marketing elements... and you might have to spend time managing different marketing tools. If you're able to host on an automation platform like HubSpot, however, you can accomplish a lot very simply. For example, you can continually monitor the performance of each page. You can see conversion rates on your landing pages and calls-to-action. You can set up easy A/B tests for different elements, like forms and buttons, to see what performs better. Marketing automation software also tracks how each lead interacts with your website, so you can improve pages based on actual user behavior. With HubSpot or a similar platform, you're able to more easily monitor the success of marketing elements on your website, which makes monthly improvements smooth and effective. No matter which platforms and tools you choose, the principle of an inbound website is what’s important. Let’s recap. What is an inbound website model? Grab the free eBook, "Grow Leads and Revenue With an Inbound Website," to learn more!